With spring here, you may have no problem thinking of ideas for your next creative endeavor. After all, that overnight summer camp that you’ll be attending in a few months may have you overflowing with ideas on how you’ll create your own graphic design pieces, model and 3D print your own creation or make your own iPhone games. On the other hand, maybe you’re so excited you don’t know where to begin. It’s times when you may feel a bit of creative block that doing some simple creative exercises can help get you loosen up, take your mind off the making the perfect project (because who are you kidding, in the end it will be) and allow your imagination to let loose. The best part about each of these mini, right-brain creative exercises is that they only take about 15-20 minutes and don’t require the skills of Picasso. In fact, each activity is designed to be done quickly and without reservation-and are great for beginners-so that you can just be yourself and get creative. Plus in that short amount of time, you’ll have sharpened your skills, which will in turn help you out in future projects that you create. In this mini-exercise, first find a quote that you may have heard or that you like. Using just a sentence or two from the quote, design a graphic that conveys the feeling of your quote. You can use anything to design your graphic; paper, pens, markers, Photoshop, Illustrator. It’s entirely up to you. “Hold fast to dreams, for if dreams die, life is a broken winged bird that cannot fly.” –Langston Hughes. Then using my imagination, I went into Photoshop and created a graphic using some vector bird images, gradients and a bit of texture. This mini-exercise requires the company of at least two other friends. Together, the three (or more if you want) of you will be collaborating to create a monster. The trick is that you won’t see what each of you will draw until the very end. First, fold three pieces of paper into three linear sections. On each folded section write a number 1, 2 or 3. Each person gets a piece of paper and starts to doodle a monster head on the top section. Get creative! It can have 20 eyes, three mouths, a Mario Bros. hat on, whatever you want to draw is perfectly fine. After each person is done, pass the paper to another person in your group. 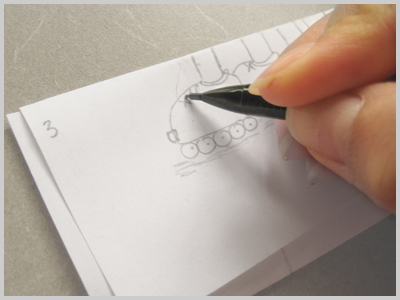 Now everyone begins to draw a monster mid-section on the #2 panel of your piece of paper. Once again, pass the paper around and then have everyone draw the legs and feet (or slime blob if your creature has no legs or feet). 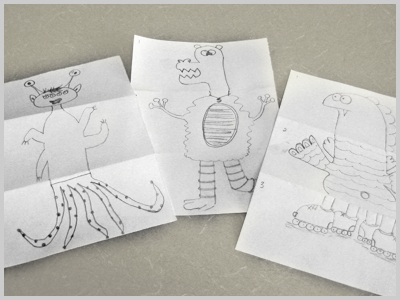 After everyone is done drawing, open up your papers and see the finished monster creation that you have drawn together with friends. Grab some sort of camera that you have around. It can be something as simple as a phone camera or as high-tech as a Sony SLR that we use in our photography camps at iD. Now without thinking about it for very long (say 20 seconds) find something in the area that you’re in that will make a good photo story and take about 10 photos (try not to take too many more or you’ll be sifting through tons of photos to find that perfect one.) The key here is to do it quickly; otherwise you’ll get caught up in the details, which might hinder your creative “looseness”. Don’t worry about your subject being silly or odd. That’s the beauty of this exercise…you can take anything and make it into a mini-story. If you have Photoshop or another photo organizing software, choose only 3-5 photos out of the 10 and arrange them to tell your story. Add any elements that you find will enhance your story, but if you can try to refrain from writing sentences or multiple words. You want the photos to tell the story. If you don’t have Photoshop, you can also print out your photos and add elements using markers, pens, crayons, buttons or anything else you have around the house. For my photo story, I looked around at my desk and didn't think I could make a story with anything. 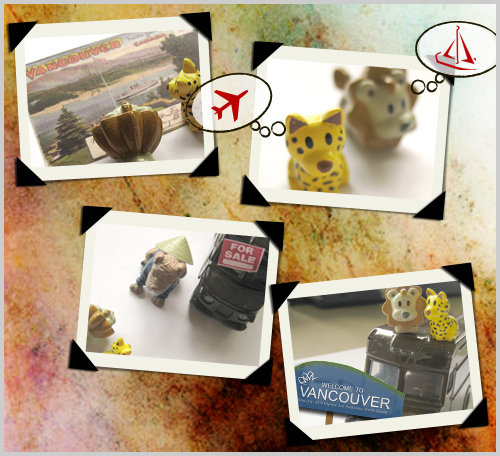 Then I saw some of the little figurines I have and took a few photos. I brought my images into Photoshop. Quickly arranged them into the order I wanted them to be, and then added some doodles and elements that I created right in Photoshop. This is what I came up with...pretty simple...but it got my right brain working. This exercise is pure fun. All you have to do grab a pencil, download the face template and begin drawing! 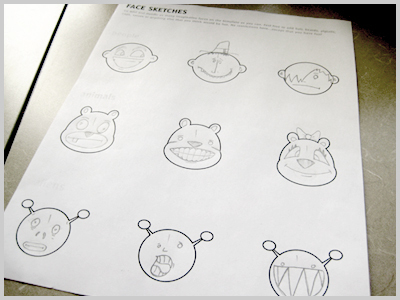 The template has nine areas for you do draw different types of faces. Don’t concentrate too hard, just quickly draw nine different faces and see what you come up with. Sketching is always a great way to sharpen your creative skills. Who knows, maybe one of the faces you draw will be a starting point for a great, 3D animated character in the future. And to prove that you don’t need to be an professional designer to begin sketching, I grabbed the talents of Roque and from iD Client Services and this is what he came up with. Nice job Roque! Download our 2018 brochure to learn more about getting your child started in design! Or, continue reading below for more exercises! Pick any subject that comes to mind. 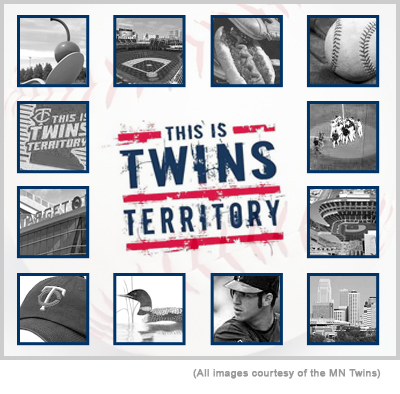 Now scour the internet and find a good amount of images of photos that go together with the subject you picked. If you want, you can take a few photos yourself too. This mini-exercise is similar to the photo story that we did earlier, but it also differs because you’re not telling a linear story, so your photos don’t necessarily need to go in any certain order. One thing to note: It’s crucial to remember to credit any person or company that you grabbed the photos from on the internet. Also, if a site specifically says not to use the photos on the page without their written permission, just don’t use it. Even though you’re creating this entirely for your personal purpose and not to re-sell or re-distribute anywhere else, you always want to make sure you’re honoring the desires of other creative individuals out there. So go out, do anything you can do be creative and know that you don’t always have to produce perfect work in all that you do or spend hours and hours of time on something…but you should always make sure you’re having fun! As always, feel free to submit any of your artwork to iD. In fact, if you like, check us out on Facebook and post a photo there of any of your creations. We’d love to see what the iD world is showcasing!